Many years ago, I visited a little community called Serenbe, immediately becoming obsessed. It’s like a small village that values health, the environment, the arts, and sustainable living. Amazing farm to table food, no pesticides, beautiful landscapes, thoughtfully designed houses, random famous people, and all things organic. I talked about it with whoever would listen and dreamed about going back. I even named one of my fictional flowers after it in The Door Keeper. But life gets busy and it’s been years since I’ve visited again, sadly. Until that is, I found out there was a new adorable bookshop that had open up last year called Hills & Hamlets. 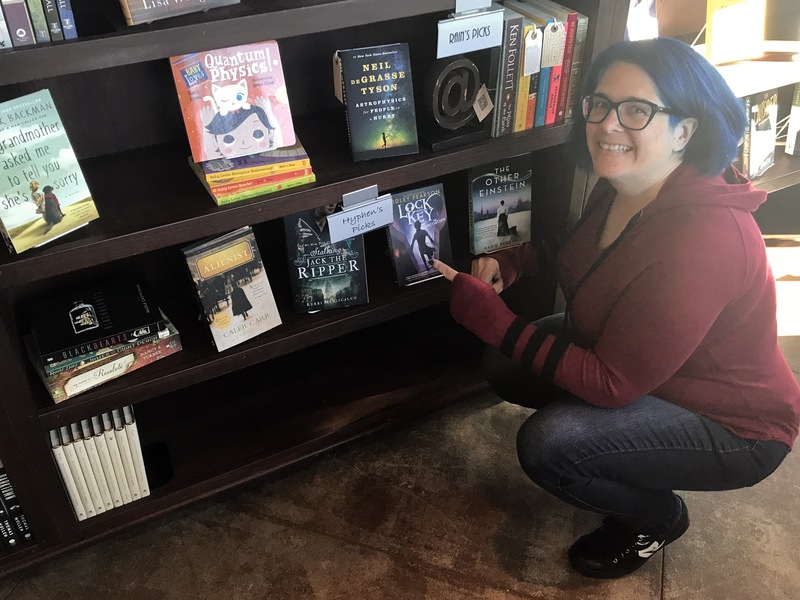 Thankfully, my friend Bonnie was just as excited as I was to check it out, so we put it on our Indie Bookstore Tour. Our introduction to Serenbe was just as beautiful as I remembered. Everything is thoughtfully designed, from street signs to trash cans. It’s as though the people here find ways to insert passion and art into even the most mundane of objects. After a quick stop into the General Store, (all organic, local, handcrafted), Bonnie and I headed over to Hills & Hamlets. Josh was just what you hope a bookshop owner is: passionate about books all bookish things. He showed us the different sections, including his favorite, the Rare Antiquarian wall. Y’all, this wall is gorgeous and every book lovers dream. Not only does H & H sell modern books, antique books by the foot, and beautiful book sets, but they sell some adorable and fun bookish things. 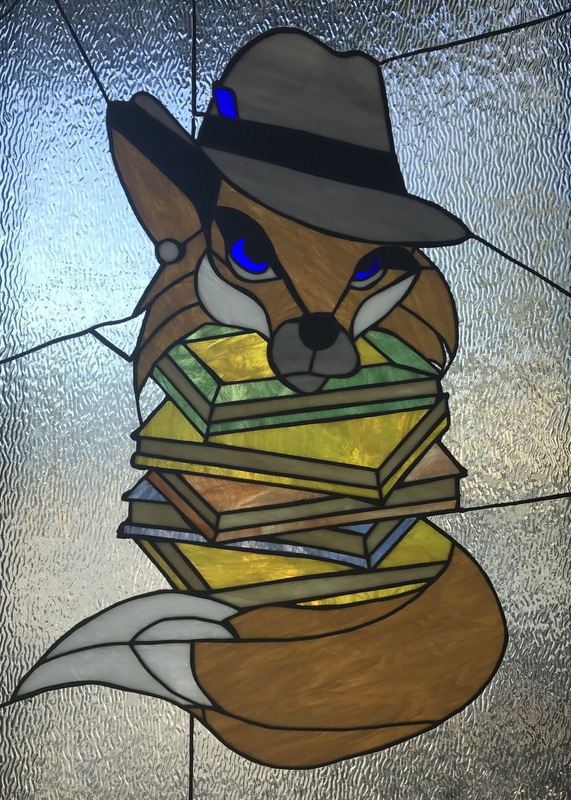 Including artwork from book passages, awesome candles called Secular Saints, and handmade journals made from vintage books! After spending some quality time in the bookstore, Josh recommended a quick stroll to the walking bridge . 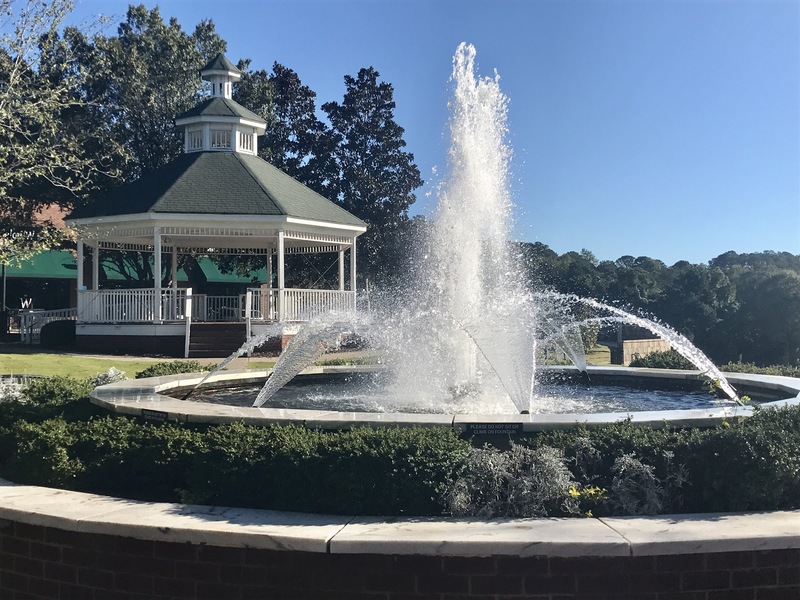 . . that apparently leads to magical journey “across the pond.” One of the new developments in Serenbe called Swann Ridge, contains houses and architecture with an European old-world flare. I’m not even going to attempt to pretend that Bonnie and I weren’t completely giddy with excitement. We also may or may not have spoken in British accents as we moseyed along the cobblestone streets. Already sold and completely in love with Serenbe, we took a moment to find our inner child, jumping on one of the many trampolines spread throughout the community. Just one more way this place encourages residents and visitors to find the fun and joy in life. Hungry and spent from our visit, we made our way to the Blue Eyed Daisy. One of my best memories from my visit before. The first of now several restaurants built in Serenbe, The Blue Eyed Daisy is sustained from the 25 acre organic farm located on the property. Seriously farm fresh. Bonnie and I both decided on the Blue Eyed Burger, a local favorite with pimento cheese. That burger sealed the deal, 10 was no longer my judge for perfection, it had become Serenbe. On a scale of 1 to Serenbe, this food, this place, was so Serenbe. 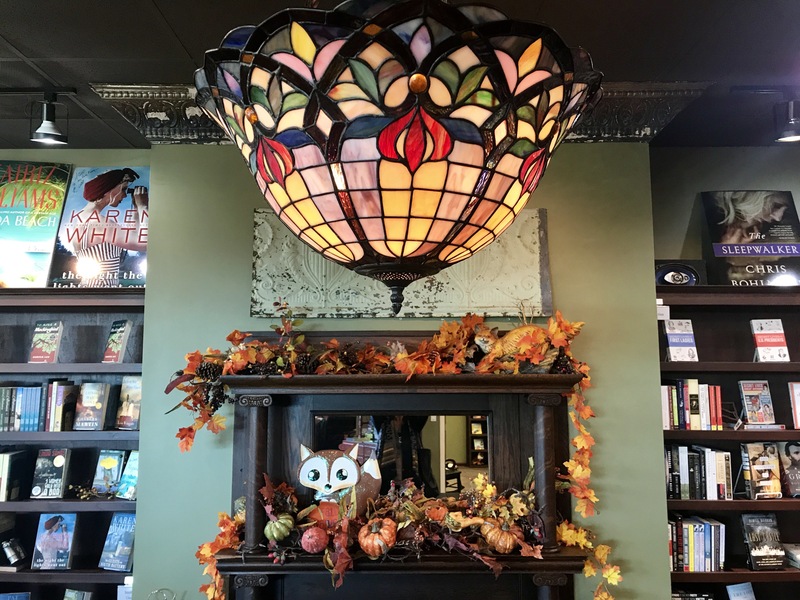 I can’t wait to go back, please check out the links I included above to learn more about Hills & Hamlets Bookshop and Serenbe. Or you should just go visit and fall in love yourself! If you’d like to read Bonnie’s account of our amazing day there, click here. Thanks for joining and I look forward to sharing stop number 3 next! Lately, I’ve been a bit obsessed with the Independent Bookstore. Everything from the unique, comfy feel and laid back charms, to the inevitable formation of relationships that seem to come easier with small businesses. I pin them on Pinterest, stalk them on Instagram, and marvel at their ability to harness my sense of nostalgia. 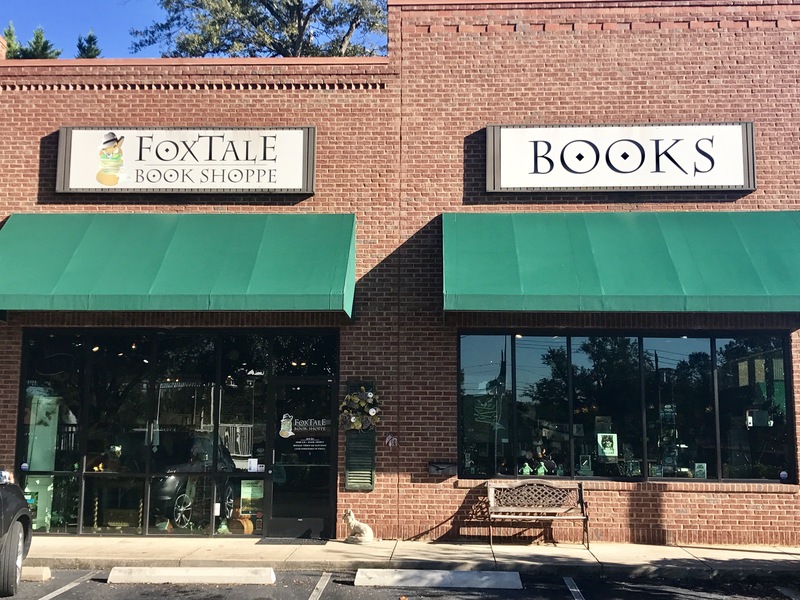 We decided to start in our own backyard with one of my favorites: FoxTale Book Shoppe in Downtown Woodstock. (I am a little bias considering Woodstock is one of the settings in The Door Keeper.) But if you’ve ever hung out or been there, I know you don’t blame me, because it’s incredible! Easily, one of my favorite things about FoxTale is the location. Tucked back off the main town square, complete with park benches, gazebo, and fountains. (Side bar: my husband asked me to marry him in that gazebo. 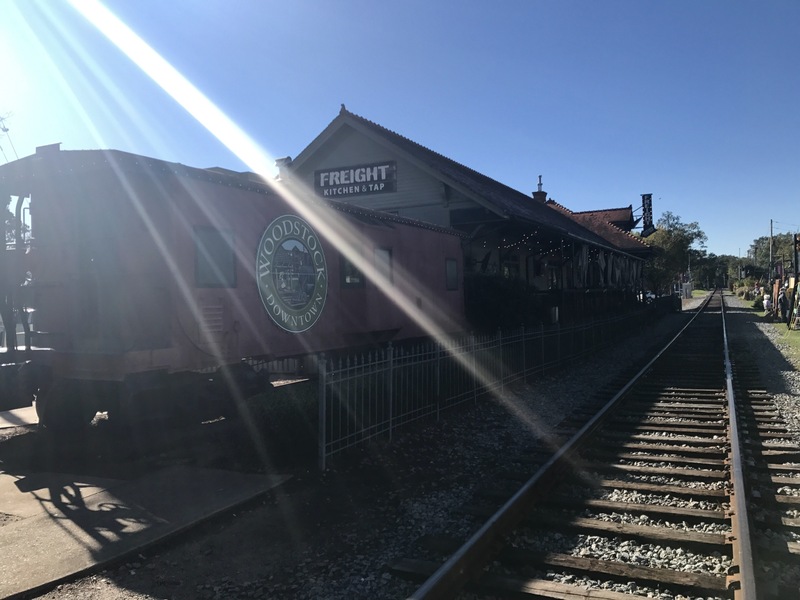 😉 Surrounded by amazing restaurants, dress boutiques, dessert shops and a new amphitheater; this book shop has the vibe you are looking for from a small town with ALL the perks. The next thing I loved about this Bookstore is the enthusiastic lady working there, a blue haired chick named Hyphen. Yes, everything about this woman brought a smile to my face. Her name, hair, book recommendations, and obvious love for all things books were not only refreshing, but super appreciated. She guided us around the bookstore, pointing out her current reads, (enthusiastically telling us the plot,) helping me find a purchase of my own, showing us the secret stash of ARC’s, (and graciously ging us each a couple,) and telling us her own story. 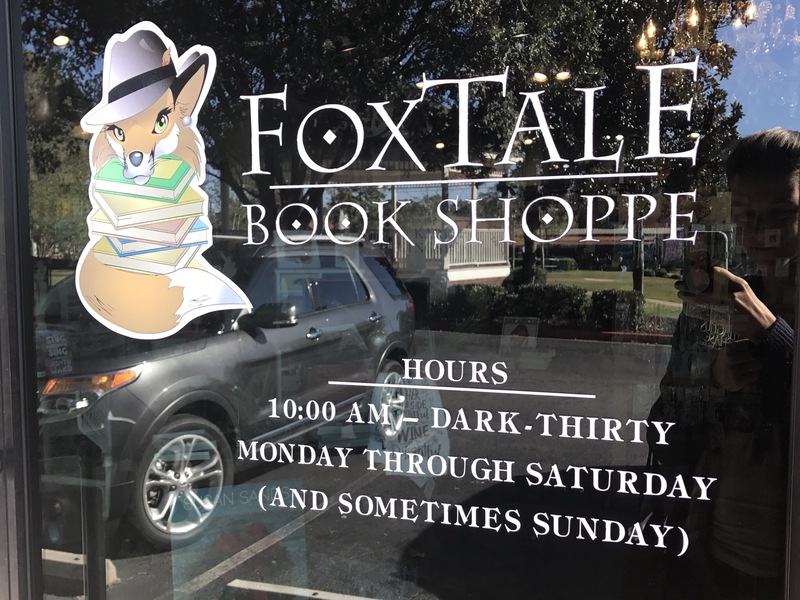 Almost 11 years ago, she was one of the first customers of FoxTale. She came so often, she eventually landed behind the check out counter working one day, and been working there ever since. Random side bar: One of my favorite things in life is a good theme. Ask anyone who knows me, when I throw a party, or start any new project, there must be a theme. It’s seriously one of my love languages. And I adored FoxTale’s theme. Everywhere I looked there was a fox of some kind. 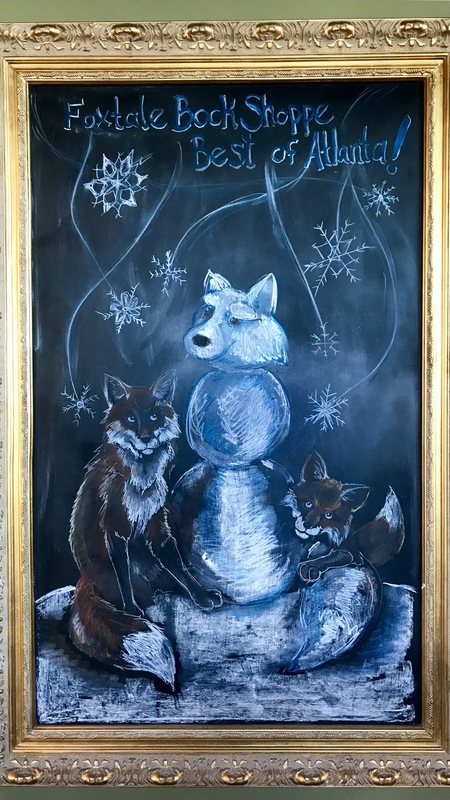 They had a beautiful stained glass window of their logo, stuffed foxes hidden on shelves, chalk art and statues strategically placed throughout the store. It was amazing. As we moseyed around the store, I noticed a beautiful door on the back wall. 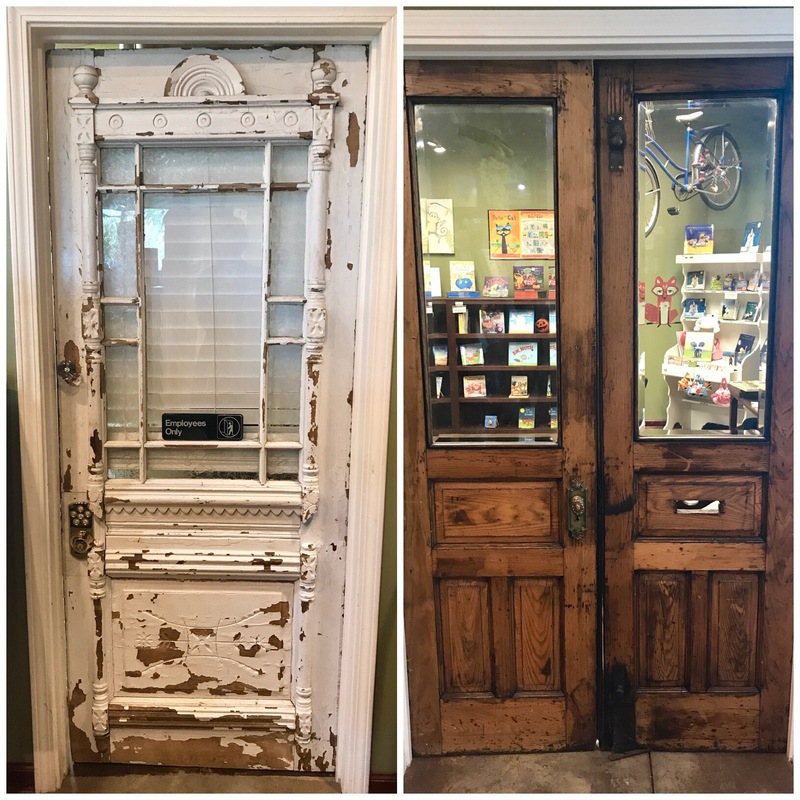 My friend Bonnie mentioned I should do a “Cool Door Count” at each bookstore we visit considering my Trilogy revolves around awesome doors. FoxTale started this super strong at an incredible 6! 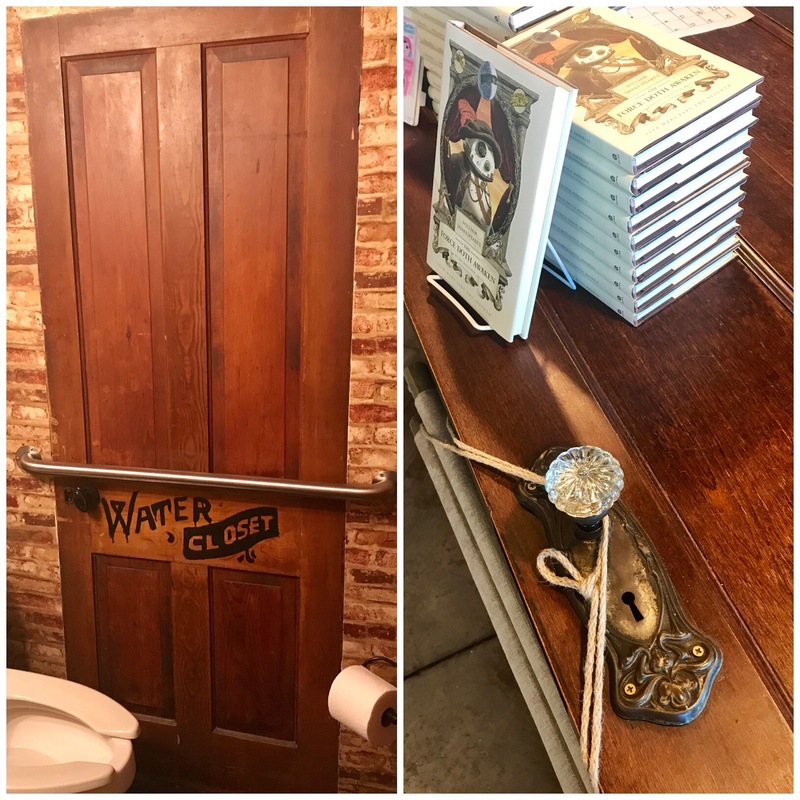 There were 6 really cool doors all throughout the bookstore; from displays, french doors, door behind secret curtains, even the check out counter was a door! Not sure if any other bookstore can compete with that. Do you have any recommendations of Bookstores for us to visit? Let me know, I’d love to hear about your favorite indie bookshops!